It was a hot and sunny Thursday morning when we walked into the SM North Annex building to line up for the Cherry Mobile Orbit 50% Sale event. As we expected, there were respectable lines already forming when we arrived at about 11:10AM. We estimated we were about the 30th in line 1, and a total of 70 people on both lines. Not bad, really. At about 11:30 a marching band starts playing to entertain the people in line. We were feeling the heat though, as the air conditioning was running on low and the escalators were turned off – a little unfortunate given the temperature outside. Sometime before 12 they started handing out warranty cards to the line. We suppose this is a great means of controlling who’s in line and who gets priority for picking up a device. Past twelve, they announced that the sale would be starting shortly and thankfully enough, the line starts moving slowly soon after. We gather there was around 200+ people waiting when the cashiers started ringing their devices through the register – and we were delighted to see that they weren’t attempting any sort of delaying tactics or other attention-grabbing programme to put us through before letting us buy their products. Instead, they had one or two employees roaming the line demonstrating the device, letting people ask questions and try the device out – this was a great way to occupy the people in line and not waste any time in the purchasing process. 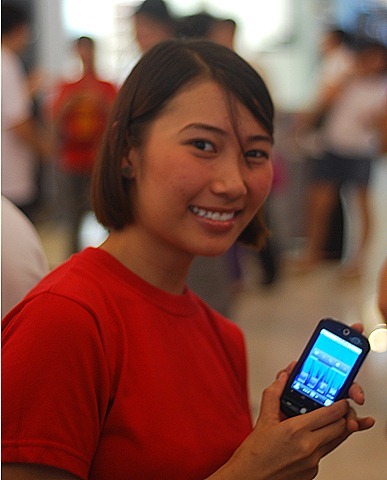 By about 1:45, we reach the cashier and receive our prize – two new Cherry Mobile Orbit Android phones. The cashier takes about 2-3 minutes per sale to process the Serial numbers on the receipt and take your warranty card, but beyond that, they weren’t trying to delay – and the staff was still quite friendly to inquiries. Before we walked out, we picked out two random giveaways and received a keychain and a nice red Cherry Mobile journal. We wonder what other kinds of giveaways there were, but we were happy with our haul. Since the sale should already be finished at the time of this writing, we hope you’re reading this with your new Orbit phone in hand. If you aren’t, then we hope you find a great sale for your target phone soon. And if you’re interested in learning what we think about the Orbit, then keep us in your bookmarks or like us on Facebook so you can be informed when we put up our unboxing, first impressions, user interface video, and review! For more pictures of the sale, check out the gallery below.